We were on our windy way to Cienfuegos from Cayo Largo on the 23 December 2000, when we heard a Pan-Pan ( a type of emergency message on the VHF). 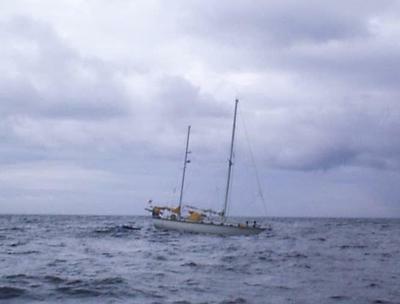 The yacht Lhamy was anchored 3 miles off the barren and wind swept island of Cayo Guano. There is a lighthouse there that looks like it was designed by Tin-Tin. Lhamy could not get to the island because their propshaft slid out and jammed their rudder. We made several attempts at trying to throw them a heaving line, eventually dad had to take it to them. We towed them to the relative shelter of Cayo Guano. We spent a rough, pitchy and windy Christmas there and finally left for Cienfuegos on the 27 December. They gave me a battery operated Santa Claus for Christmas. This is "LHAMY" see the full story in the Journal page, This was taken just before we put a line across to tow them to safety.